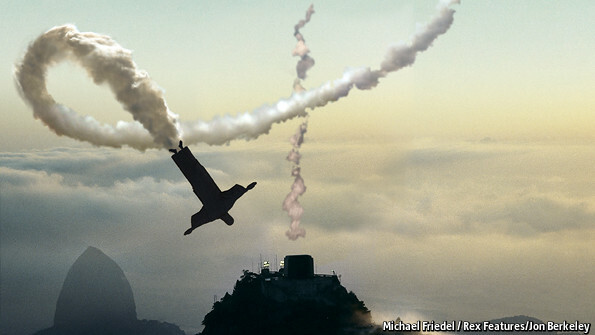 FOUR years ago this newspaper put on its cover a picture of the statue of Christ the Redeemer ascending like a rocket from Rio de Janeiro’s Corcovado mountain, under the rubric “Brazil takes off”. The economy, having stabilised under Fernando Henrique Cardoso in the mid-1990s, accelerated under Luiz Inácio Lula da Silva in the early 2000s. It barely stumbled after the Lehman collapse in 2008 and in 2010 grew by 7.5%, its strongest performance in a quarter-century. To add to the magic, Brazil was awarded both next year’s football World Cup and the summer 2016 Olympics. On the strength of all that, Lula persuaded voters in the same year to choose as president his technocratic protégée, Dilma Rousseff. There are excuses for the deceleration. All emerging economies have slowed. Some of the impulses behind Brazil’s previous boom—the pay-off from ending runaway inflation and opening up to trade, commodity price rises, big increases in credit and consumption—have played themselves out. And many of Lula’s policies, notably the Bolsa Família that helped lift 25m people out of poverty, were admirable. But Brazil has done far too little to reform its government in the boom years. It is not alone in this: India had a similar chance, and missed it. But Brazil’s public sector imposes a particularly heavy burden on its private sector, as our special reportexplains. Companies face the world’s most burdensome tax code, payroll taxes add 58% to salaries and the government has got its spending priorities upside down. An own goal for Dilma Fernández? But if Brazil is to recover its vim, it needs to rediscover an appetite for reform. With taxes already taking 36% of GDP—the biggest proportion in the emerging world alongside Cristina Fernández’s chaotic Argentina—the government cannot look to taxpayers for the extra money it must spend on health care, schools and transport to satisfy the protesters. Instead, it needs to reshape public spending, especially pensions. Second, it must make Brazilian business more competitive and encourage it to invest. The way to do that is not, as the government believes, to protect firms, but to expose them to more foreign competition while moving far more swiftly to eliminate the self-inflicted obstacles they face at home. Brazil’s import tariffs remain high and its customs procedures are a catalogue of bloody-minded obstructionism. More dynamic Latin American economies have forged networks of bilateral trade deals. Brazil has hidden behind Mercosur, a regional block that has dwindled into a leftist talking-shop, and the moribund Doha round of world-trade talks. It needs to open up. Third, Brazil urgently needs political reform. The proliferation of parties, whose only interest is pork and patronage, builds in huge waste at every level of government. One result is a cabinet with 39 ministries. On paper, the solution is easy: a threshold for seats in Congress and other changes to make legislators more accountable to voters. But getting those who benefit from the current system to agree to change it requires more political skill than Ms Rousseff has shown. In a year’s time Ms Rousseff faces an election in which she will seek a second four-year term. On her record so far, Brazil’s voters have little reason to give her one. But she has time to make a start on the reforms needed, by trimming red tape, merging ministries and curbing public spending. Brazil is not doomed to flop: if Ms Rousseff puts her hand on the throttle there is still a chance that it could take off again.